It’s been a while since I’ve given a restaurant 5 clubs. 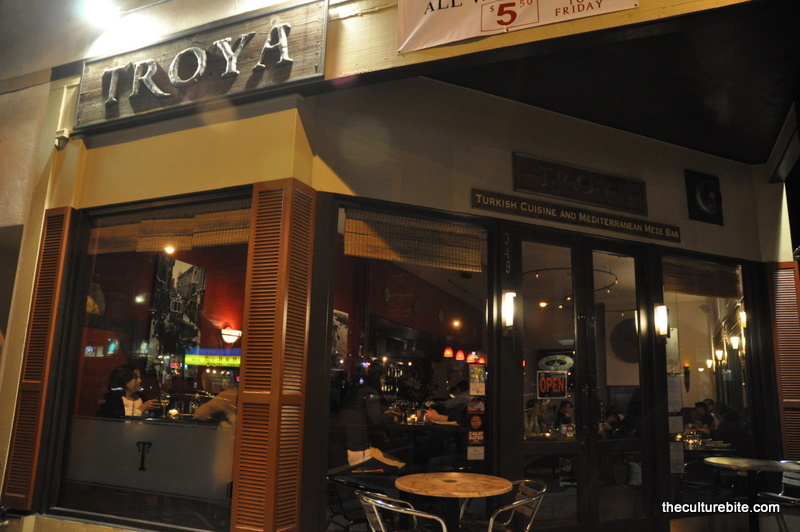 And Troya, an authentic Turkish restaurant in the Inner Richmond, completely deserves a perfect score. Troya is a cute little restaurant on the corner of 4th and Clement. Dark ambiance, candles on every table – such a cute place for a date night. We started with two appetizers – flat bread topped with ground lamb and spices and super moist crab cakes. Both were amazing, especially the flat bread. Smoky, earthy… with a hint of cumin. Boy, I could eat that flat bread every day if I knew how to make it. Now it’s time for kebabs. I had the kofte kebabs (lamb meatballs). Oh it was so delicious. So tender and juicy. Each meatball exploded with flavor with each bite. Dip it in the hot sauce for some serious heat. K’s lamb cube skewers were just as tasty. For such tiny pieces, each was cooked perfectly tender. And they were lean! Major plus. As if the meal couldn’t get any better, we had dessert. K and I shared the kunefe, shredded phyllo dough (kadayif) wrapped around a soft cake-like cheese topped with a simple syrup and crushed pistachios. The crunchy dough resembled crispy noodles and the center was warm and gooey. We were so full from dinner, I was surprised when we devoured the dessert and licked the plate clean in seconds. As if you couldn’t tell, I thoroughly enjoyed this meal. The meal, the service and the price – the entire experience was perfect. I just can’t wait to come back! Spring has sprung! Get out of your chair, step away from your computer, and come down to the Ice House Alley Farmers Market. Come try something new, get some fresh air, catch up with old friends, and make some new ones. Our goal is to make sustainability simple, tangible, and fun. Remember: bring some green because these vendors are cash-only. Hapa Ramen, Tacolicious, Piperade, El Porteno Empanadas, and CoraCao Confections. Please feel free to invite your co-workers! Blegh! I will never use Urban Spoon again because it recommended this restaurant. Food wasn’t fresh, service was bad, and dishes were dirty! Is it really that bad? Well, I found some food particles in my cup of water and I asked the waitress to get me a new cup (nicely). Instead of doing so right away, the waitress picked up the cup and inspected the glass of water! It was as if she didn’t believe me! Well, nothing really stood out on the menu, so K and I got the sushi combos. It came with a salad which was probably the worst Japanese salad I’ve ever had. All other Japanese salads are light and refreshing with a sweet miso dressing. This one left a powder residue in my mouth like it was an old, just-add-water type of dressing. I had the spicy tuna and the California roll. I can’t eat wasabi, so I checked with the waitress to see if they used wasabi in their spicy tuna. She said “no,” but when I took my first bite, all I could taste was wasabi! I couldn’t eat it after that, so I made K eat it for me while I ate his eel roll. The empty restaurant should’ve been a sign, but I stepped in anyway. I recommend Sushi Sam in San Mateo or Sushi Zone in the Castro if you want some fresh sushi. I’ve been driving past Chick-N-Coops around the city for years and I’ve never got myself to try it until recently. I have to say, it was really fun! My dad comes all the time for lunch, so he took K and I to introduce us. Walking into the hoffbrau was like walking into a time warp. The customers, the employees, the decor – it felt like nothing in the restaurant has changed in the last 40 years. I got the corned beef sandwich “wet” on a roll. Wet means au jus on the bread, nothing else. So simple but so very tasty. The roll is so soft and chewy, a perfect match for the briny corned beef. This also passed the day after test. My dad had his usual wet turkey sandwich. Mm, juicy turkey. And, K got the wet pastrami sandwich. We all agreed the corned beef and the turkey were the winners of lunch. We got the cole slaw as a side, but I wasn’t a fan. Too watery and too much mustard. Chick-N-Coop was a fun adventure and I’d definitely come back again for the wet corned beef sandwich.